ID card design software provides highly advanced and convenient method to design professional looking identification cards for your personal and business needs. ID card maker program empowers you to craft different types of identity cards including Company employee ID card, Student ID card, Faulty ID card, Staff ID badges, Photo ID card, Name tags and many more in less time and efforts. Utilize specialist Identity card designer tool to create great looking premium identification cards having desired look and features. 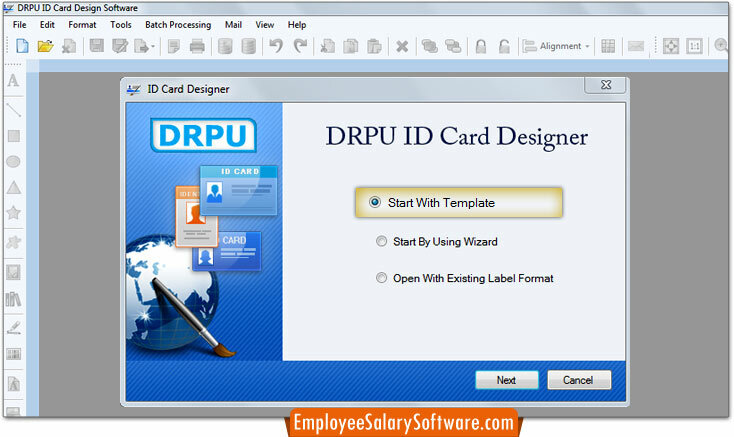 ID card software is specially formulated with a visual interface that provides various card designing tools including Line, Ellipse, Pencil, Rectangle, Text, Barcode, Picture, Arc, Triangle and Star objects to fabricate personalized identification card for entire types of business organizations as well as personal needs. Design personalized Identification card : ID card creator software is fully able to generate personalized ID card in minimal time and efforts. Expertise photo, color and image settings : Sophisticated photo, color and image settings will help you to design most stunning ID card. Flexible printing settings : Advanced printing settings helps user to print multiple numbers of identification card simultaneously. Expertise ID card maker tool allows user to create ID cards in distinguish shapes including rectangle, ellipse and rounded rectangle. Add photo, text, logo and graphics : ID card designer software provides facility to add photo, text, logo, barcode, graphics and images during the card generating process. Smart ID card generator program provides option to modify existing ID card or design new ID card according to your requirements. Sophisticated dataset series feature : Specialized dataset series feature empowers user to craft multiple numbers identity cards using different barcode and text value. No any technical assistance is needed to operate the software or any programming skill is required to use the program.